Hyssopus officinalis is an herbaceous plant of the Lamiaceae family. Hyssop is a brightly colored shrub or subshrub that ranges from 30 to 60 cm in height. The stem is woody at the base, from which grow a number of straight branches. Hyssop leaves are lanceolate and dark green in color; they range from 2 to 2.5 cm in length. The plant produces fragrant bunches of pink, blue, or occasionally white flowers in the summer. The flowers give rise to small oblong achenes. 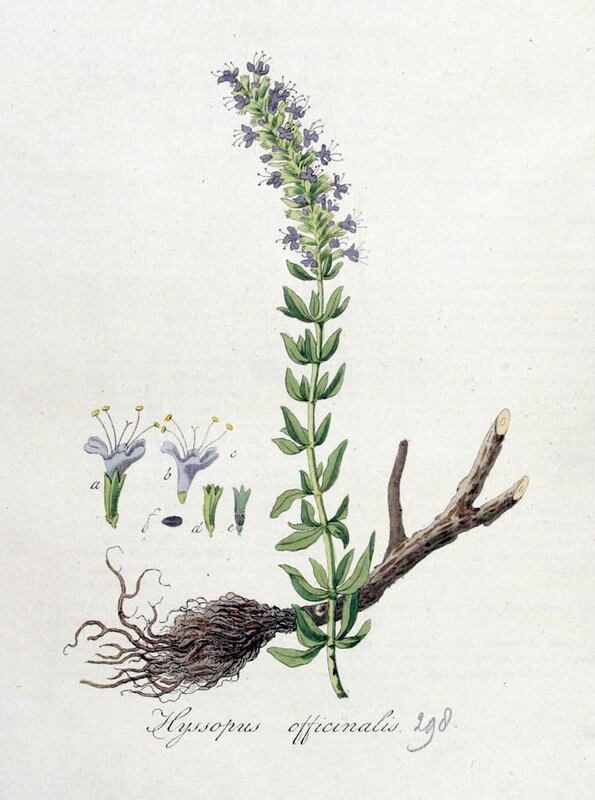 Hyssop is Greek in origin. The Hyssopos of Dioscorides was named from the holy herb azob, because it was used for cleaning sacred places. Hyssopus officinalis is native to Southern Europe, the Middle East, and the region surrounding the Caspian Sea. The species as a whole is resistant to drought, and thrives in full sun and warm climates. Hyssop is tolerant of chalky, sandy soils. Sow seed in spring in a cold frame and only just cover the seed. The seed germinates quickly. When seedlings are large enough to handle, they can be transplanted into individual pots to be grown in a greenhouse for their first winter. They can be planted into their permanent locations in late spring or early summer, after the last expected frosts. Hyssop plants can also propagate via cuttings or division. 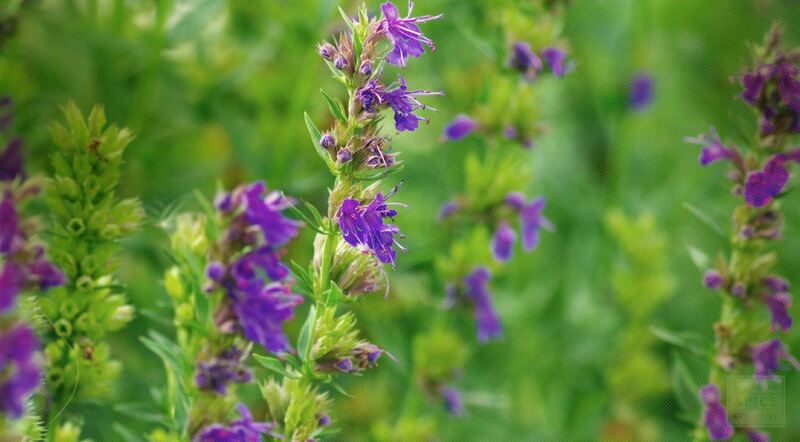 Hyssop is harvested twice yearly, once at the end of spring and once more at the beginning of the fall. Preferably the plants are harvested when flowering. This allows one to collect the flowering tips. Once the stalks are cut, hyssop are collected and dried by either stacking on pallets (to allow for draining), or hung so as to dry in a cool, dry place. Once dried (approximately 6 days), the leaves can be removed and chopped finely. Store dried hyssop in an airtight container in a cool, dry place.